Thanks to the StaySharp™ cutting system, the push lawn mower's blades won't need sharpening for years to come. 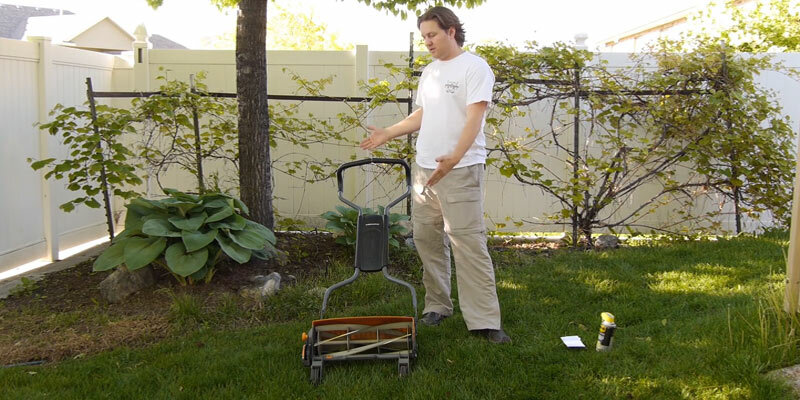 This cutting-edge manual reel mower is 60% easier to push compared to other competing tools. The unit is quite heavy which makes it more difficult to transport. The manufacturer of Staysharp Max reel mower has implemented a winning combination of advanced technologies to gain twice the cutting power compared to conventional push lawn mowers. The Scotts Classic manual mower has a large cutting deck providing a wide 20-inch cutting path. A variable height adjustment will let you choose the best grass length. It needs additional adjustment for a 1'' cutting height. This hand push lawn mower will help you look after all the grass types and spend less time maintaining a large lawn in a good condition. The light weight makes this American lawn mower extremely mobile. 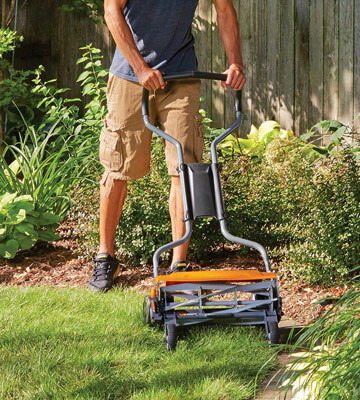 A narrow cutting deck will let you mow the lawn in hard-to-reach places. This wonderful hand push lawn mower is a perfect choice for a small yard with many narrow areas. You can easily handle all obstacles and spend less time on grooming the grass. 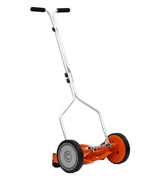 The unit has 10-inch wheels that ensure good maneuverability and it is easy to use even on thick grass. Equipped with a high-quality ball bearing mechanism, the unit makes minimum noise. The model is less effective at dealing with long grass. 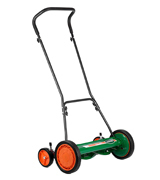 Perfect for cutting small and medium-sized lawns, this model will easily handle shorter grass. It has an ergonomic design to provide comfortable mowing, so you will be able to use the unit for quite a while without getting tired. 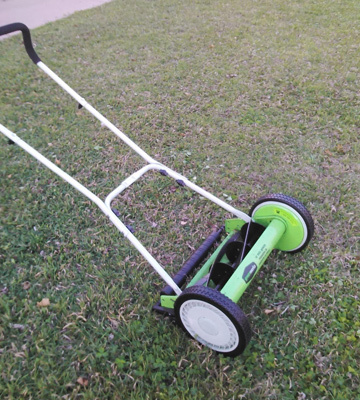 A contact-free cutting system of this GreenWorks reel lawn mower makes for a long service of the blades. The manufacturer provides a 4-year warranty. The grass sometimes misses the bag. 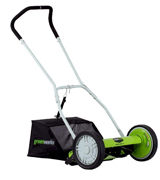 The GreenWorks hand push lawn mover is an excellent choice for those who need to care about a medium-sized garden or lawn. This model is a brilliant example of how innovative technologies can improve the mowing efficiency. Equipped with thick blades and a large diameter cutting reel, the item boasts double the cutting power of its competitors. Moreover, the manufacturer claims that the unit is 60% easier to operate compared to your typical mower. And, according to the consumer's feedback, this is indeed a very effective hand grass mower. 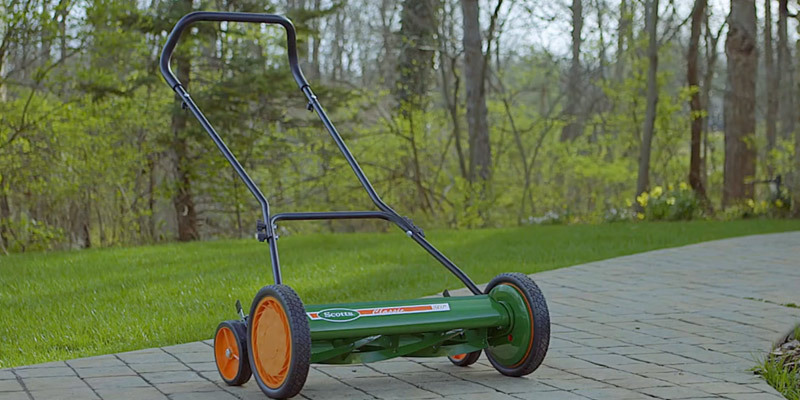 The powerful push lawn mower easily cuts down all types of grass, even the toughest ones. A VersaCut™ technology allows you to adjust the grass cutting height from 1 to 4 inches simply by shifting the handle located over the right front wheel. 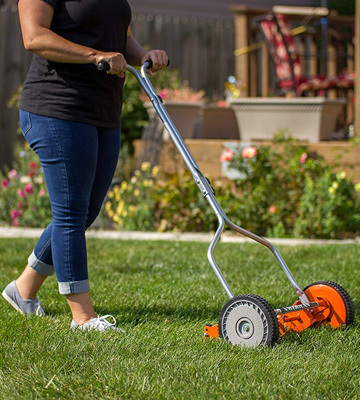 An 18" cutting width provides quick and clean mowing, while the inset wheel design will let you cut the grass within the closest distance to the edges of your lawn. 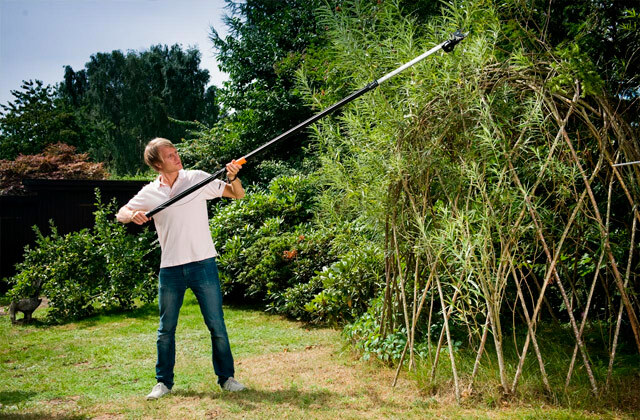 Moreover, the item has a reversible grass chute, allowing you to direct chippings both forward and backward. A forward discharge helps to keep the grass away from your feet, while a rear discharge enables easier mowing through thicker grass. 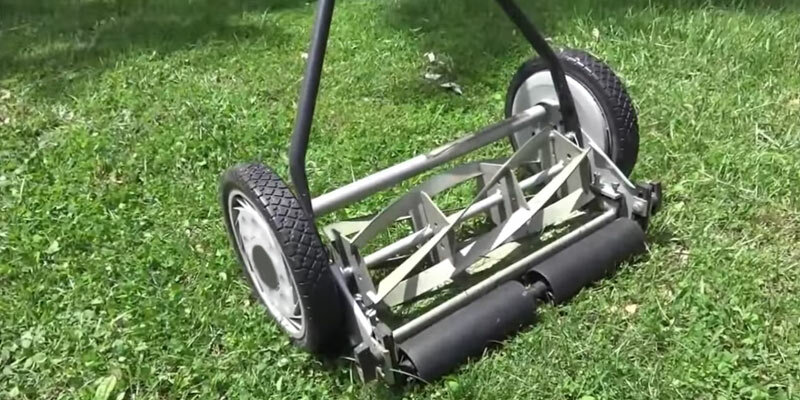 This motorless lawn mower has robust precision-ground blades that neatly cut the grass. A contact-free StaySharp™ cutting system reduces friction and blade wear so the blades will not require frequent sharpening. Besides, the device is equipped with a large and heavy cutting reel. The improved inertia enables you to cut through tough grass species, including St. Augustine, Bahia, and Bermuda, with no difficulty at all. 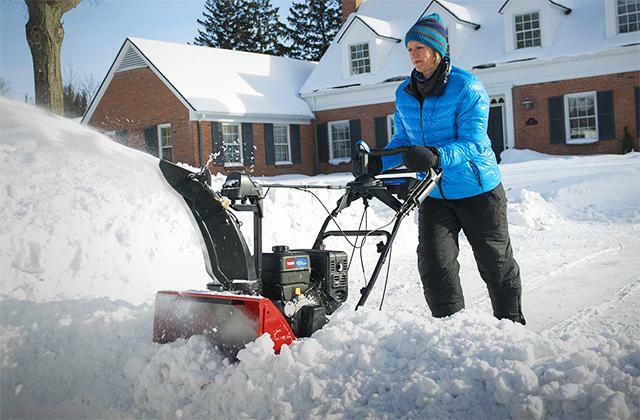 In spite of its considerable weight, the device is very mobile due to a reliable chain-drive mechanism and ergonomic wheels. Though manual lawn mowers are usually more effective on flat surfaces, a number of users suggest that this model can be just as successfully used on hills. 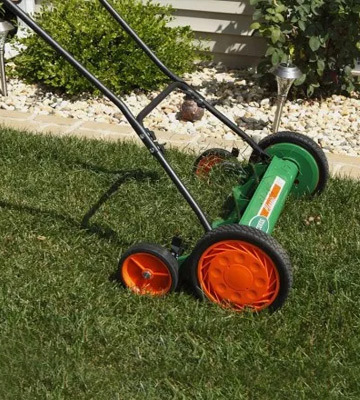 To ensure easy maneuvering of this push reel lawn mower, the manufacturers made sure to implement an ergonomically curved handle with comfy grips. You can easily adjust the handle height for the most comfortable mowing or even detach it for simple transportation and storage in your shed. Furthermore, the model has a grass catcher installing option, so you can buy one separately. 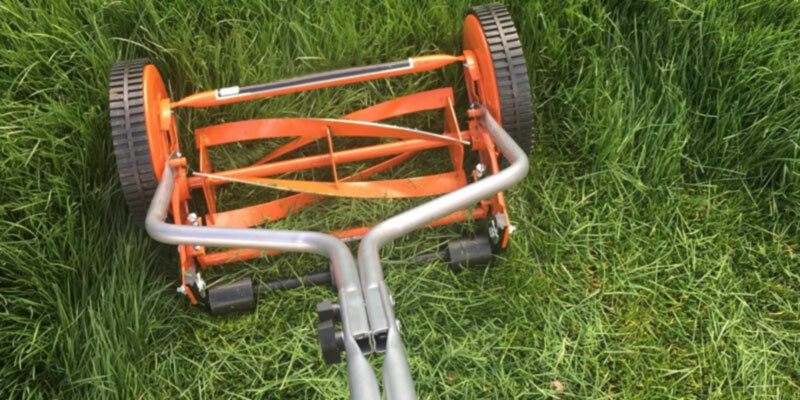 Summing up, if you are looking for an efficient yet eco-friendly hand grass mower that requires no gas or electricity and causes no air or noise pollution, this Fiskars model is as good as it gets. Hand grass mowers are usually used to maintain smaller yards. However, this model can be just as effective for mowing larger areas. 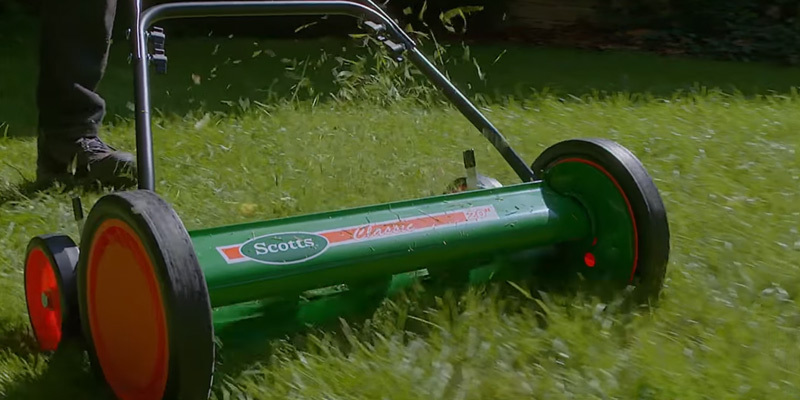 The Scotts Classic reel push lawn mower boasts wide cutting width. Thanks to this feature, you can easily mow a 20" patch in a single pass. In such a way, you will be able to decrease the number of passes you need to make in order to mow the whole lawn and save your time and effort. That is why this push reel lawn mower is perfect for maintaining yards and gardens of medium and large sizes. To add to its benefits, this motorless device is super simple in operation; you can easily change the cutting height with the quick-snap height adjusters. There are nine different positions that will allow you to set the grass height from 1" up to 3". This modification has five heat-treated blades that keep sharp for a really long time. Large 10-inch composite wheels and smaller 6-inch tracking wheels eliminate drag providing ease of use and high maneuverability on uneven surfaces. The composite wheels are equipped with rugged radial tires to provide a proper surface traction and keep the push lawn mower well balanced. Allowing for easy rolling, this also helps you enhance mowing accuracy, for these are the wheels that turn the reel. 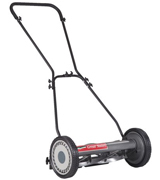 The Scotts Classic hand reel push lawn mower features a contact cutting system. This user-friendly model has a loop-style handle with a foam grip so you can use it for a long time without any discomfort. No tools are needed to assemble the unit. When the job is done, you can easily detach the handle - just undo the four screw-bolts. This allows for easy storage and transporting the reel lawn mower with no fuss. 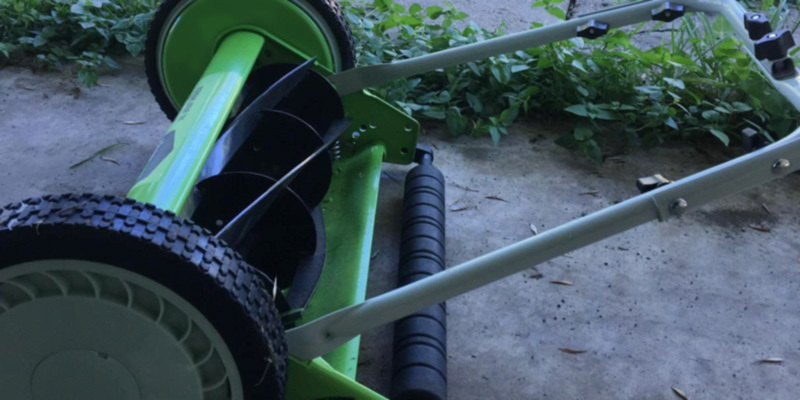 The Scotts manual lawn mower has a rear grass discharge; you can use the grass cuttings as a mulch or install a grass catcher (sold separately) and add them to your compost pile. If you have a large garden, we recommend that you also get a mulcher that will allow you to enrich the soil with nutritious mulch that it will produce by composting leaves, twigs, and branches. If you want your lawn to look tidy and inviting, opt for the American Lawn Mower. 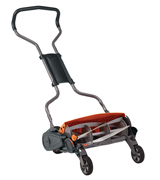 This push reel lawn mower is ideal for taking care of a small yard or garden. It works well for most turf grasses and it is especially recommended for cutting bluegrass, rye, and fescue. 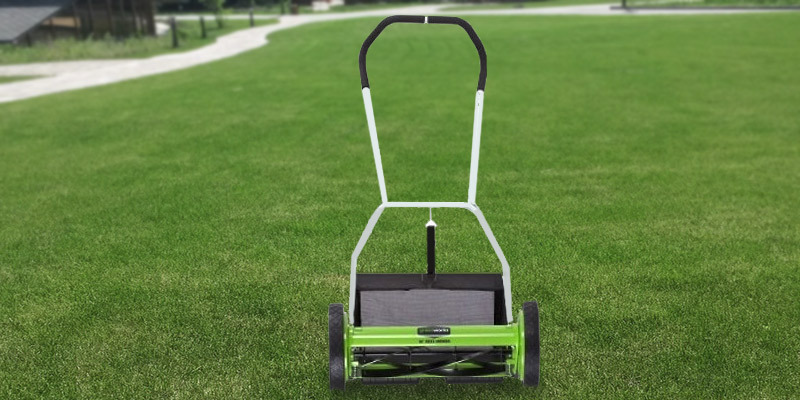 The unit has three positions of grass height adjustment (from 0.5 up to 1.5 inches), so it is an excellent choice if you like the grass cut short. 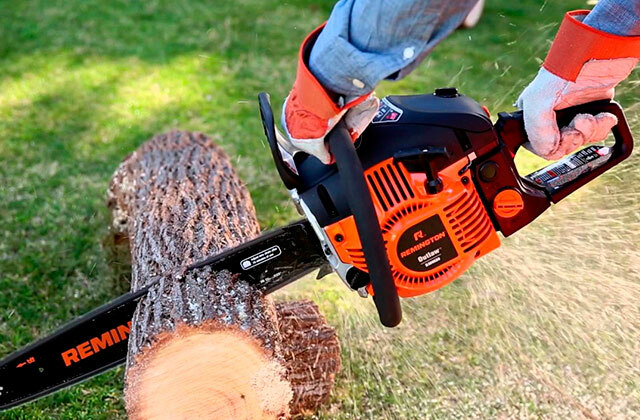 A 14-inch cutting width enables precise mowing and high maneuverability in narrow areas with lots of obstacles such as trees and shrubs. If that sounds like your garden, now you have found the motorless lawn mover that suits you best. Alloy steel blades are wear-resistant and long-lasting. If you're tired and sick of the need to constantly sharpen blades, you’ll be pleased to know that this mower requires sharpening no more often than once a year (and not necessarily). If used carefully, the blades won’t get blunt for years. 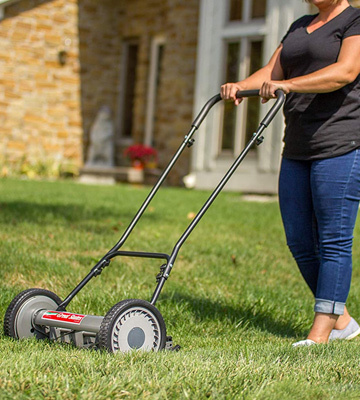 The American Lawn Mower 1204-14 provides a scissor-like cut at any rotational speed, so you’ll always achieve the desired results and well-groomed look of your yard. The reel and blades are driven by 8.5” wheels. You should keep in mind that, equipped with four blades, the unit might be not effective for mowing too high grass and weeds. However, it is a real find for smaller areas with softer grass species. Light weight and small size are the features that set the American Lawn Mower 1204-14 lawn mower apart from the other models in our review. This lawn mower is so small even a child could easily navigate it across the lawn without experiencing any strain. The machine has a convenient, plastic T-shaped handle, similar to that you'll see on bicycles, which provides a sure-grip without slipping. This handle is easy to hold with both hands and easy to guide in various directions. One downside to the American Lawn Mower 1204-14 lawn mower is that it has no grass catcher, however, if you do need to have one you can always purchase it separately. 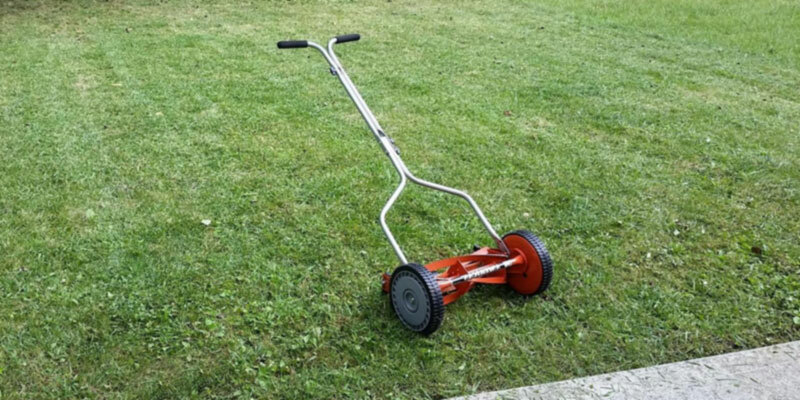 In all, this reel lawn mower is a very good option if you need a simpler tool with an affordable price tag for garden maintenance. The Great States brand is owned by a domestic company with over 120 years experience in reel mowers manufacturing. By this day, American Lawn Mower Company has created several brands, doing their best to continuously improve their products. That said, a reel lawn mower - a mechanical device that requires no gas or electricity, always had a special place among them. 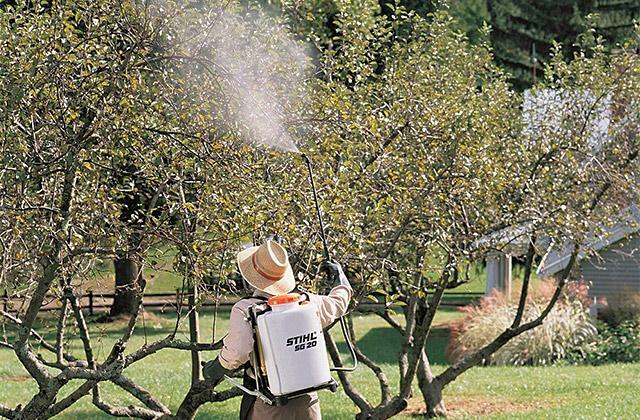 Aside from being harmful to the environment, this wonderful invention does not damage your lawn's health as well. While rotary mowers shred grass blades, an approach that often causes plant diseases, push reel mowers snip the grass like scissors without damaging it. As a result, your lawn undergoes less stress and looks much tidier. All the company products are known for their high quality, and this model is not an exception. So, if you are looking for an efficient and ergonomic hand grass mower, the Great States 815-18 may be just the one you need. Let's have a closer look at the unit. Designed to help you keep your lawn green and neat, this Great States model is also very convenient in use. All you have to do is push the model and walk behind it as the device evenly cuts the grass. All the manual lawn mower's parts were designed to make the job as easy as possible. Pretty lightweight, the unit is easy to maneuver on its 10-inch ball bearing wheels that have radial tread tires, both reliable and durable. Moreover, the push reel lawn mower has a comfy cushioned loop-style handle, powder-coated to prevent corrosion and rust. Optionally, you can buy a grass catcher and a sharpening kit to keep the blades razor sharp. After use, the motorless lawn mower is easy to store in a shed or garage where you can park the compact unit or even hang it on a wall. This model has a reel with 4 spiders and 5 sharp heat-treated blades. 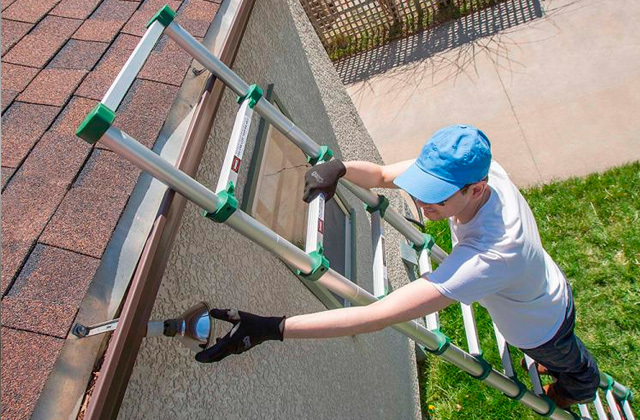 If the unit is properly adjusted and lubricated, the blades will stay sharp for years. The manual lawn mower features a varied height adjustment starting with a really short 1/2" cut up to 2-3/4" grass length, so you can give your lawn the desired look. Aside from being perfect for mowing smooth yards, this model also works quite well on slopes. However, if your garden is uneven and bumpy, a gas lawn mower or an electric one may be a better choice. Summing up, this convenient 18-inch lawn mower is a perfect tool designed to help you maintain your small to medium-sized garden or yard. 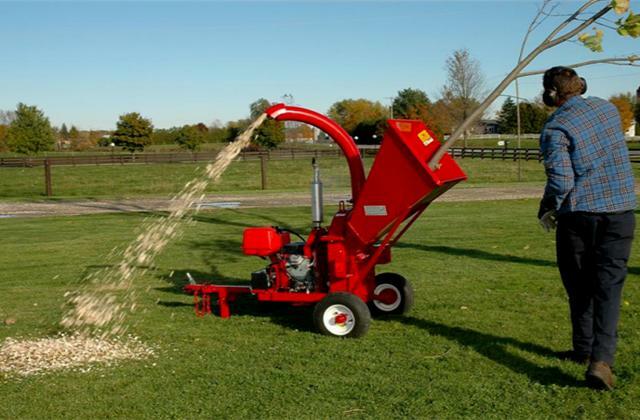 To keep the lawn thick, healthy, and green, it is also important to regularly feed the soil with nutrients which is a simple task if you have a fertilizer spreader. All GreenWorks products are created with our planet's health in mind. Using a hand grass mower is a perfect way to reduce air pollution while keeping your lawn in a perfect condition. Forget about refueling, noise, and fumes; with this model, you'll start to find enjoyment in being outside and taking care of your lawn. Offering a cutting width of 16'', this manual lawn mower is a perfect tool for maintaining small yards. For those who need to mow medium-sized or large lawns, the manufacturer offers models with 18'' and 20'' cutting widths. Depending on the grass type, and your preferences, you can select one of four available cutting heights varying from 1.125'' to 2.25''. 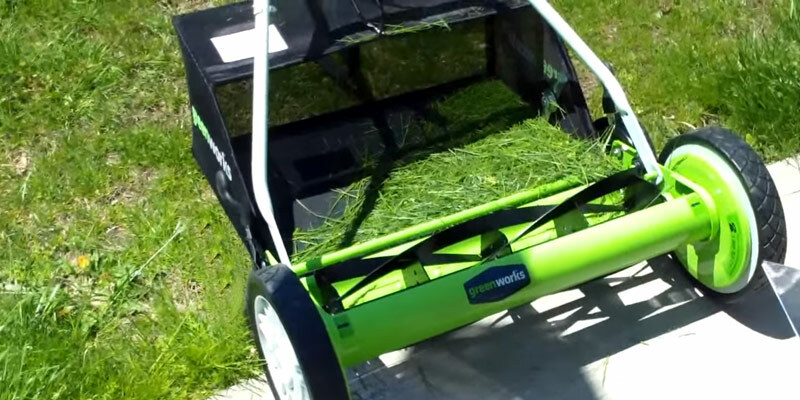 Thanks to a handy 2-in-1 feature, you can either use choppings for mulching your lawn or gather them into a handy grass catcher included in the purchase. Owing to a contact-free cutting system, the blades of this reel lawn mower remain sharp throughout the whole season. To keep the blade edges fine, you just need to spend 10 minutes once a year on sharpening them. A cutting reel with five blades is driven by 10" wheels, so the speed of the reel rotation is high and the grass cutting is accurate. The unit also has 2" rear rollers that will make maneuvering around your lawn an easy task. All of these features contribute to an effective grass mowing. 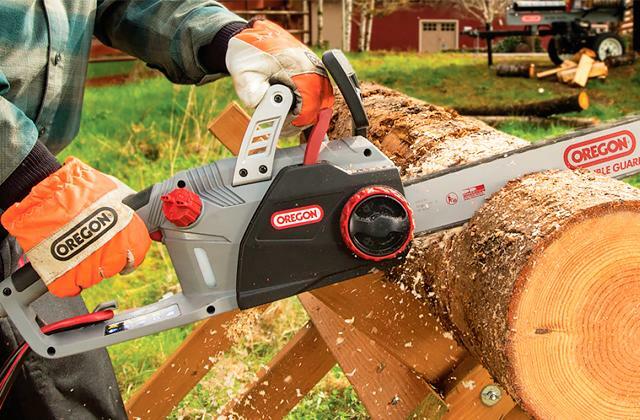 Finally, a loop-style handle with foam-covered grips will make the process convenient. Besides, the handle has a dismountable design for easy storage and transportation. As we have mentioned above, this GreenWorks lawn mower comes with a special bag for grass. This option simplifies your lawn care since the grass is not thrown onto the ground but goes directly to the bag. Thanks to the same option, you'll get a natural fertilizer that you could use for soil enrichment (read about fertilizer spreaders). In conclusion, this lawn mower will come to liking to those customers who search for a robust yet not too much expensive self-propelled model that will do the job nicely and won't tire them much. With a grass catcher option, the Greenworks 25052 lawn mower has all the potential to become your garden tool for life. Review of GreenWorks 25052 Reel Lawn Mower. What Is a Reel Push Lawn Mower? The reel lawn mowers are mechanical tools designed for maintaining your lawn and garden. In contrast to motorized lawn mowers, hand push counterparts are environmentally friendly, they require no fuel, no charging or power cords. Manual lawn mowers have a special blade design that will enable you to do a tidy, scissor-like cutting of your lawn, to keep the grass healthy and nice looking. Push reel lawn mowers require no advance preparation before using so you will be able to swiftly mow your lawn. Besides, they are quite lightweight and easy to roll around. Please, read the push reel lawn mowers review that we've prepared for you and choose the best machine to maintain your yard and garden. If you need a machine designed for mowing large lawns or even fields, look through our lawn mowers and riding lawn mowers reviews. We have picked the most popular models for you to choose the one that will suit your needs. Nowadays, there is a wide range of push reel lawn mowers on the market, and each landscaping machine has its own peculiar features that condition its efficiency. The first hint to follow in making the right choice is determining the tasks you are going to perform with the equipment. If you plan to mow a flat lawn with very few natural obstacles, the wide cutting width mowers will hit the mark. They will help you look after your lawn with minimal efforts and no hustle. 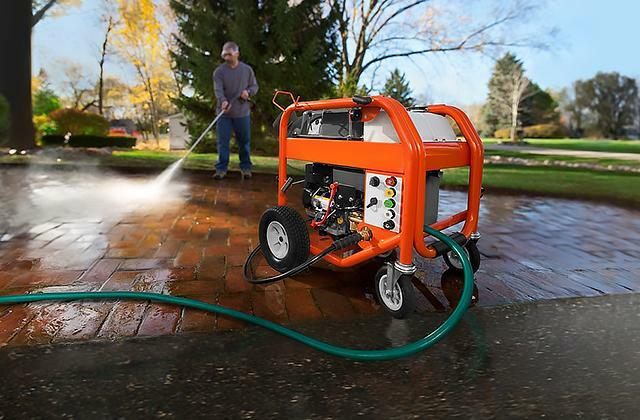 Using this equipment makes your lawn maintenance easy and time-efficient. If there are many narrow areas or other obstacles in your yard, manual push lawn mowers with small cutting width will be more effective. An adjustable cutting height allows getting the perfect length of the grass after the cutting. There are models for cutting the grass with different maximum/minimum height, depending on your needs. A mulching option will let you cover the ground with short grass clippings, to preserve the water and essential minerals in the ground while keeping your lawn in a beautiful shape. Choosing the push reel lawn mower that is able to serve you for a long time without the blades sharpening requires considering its cutting system, design and material. 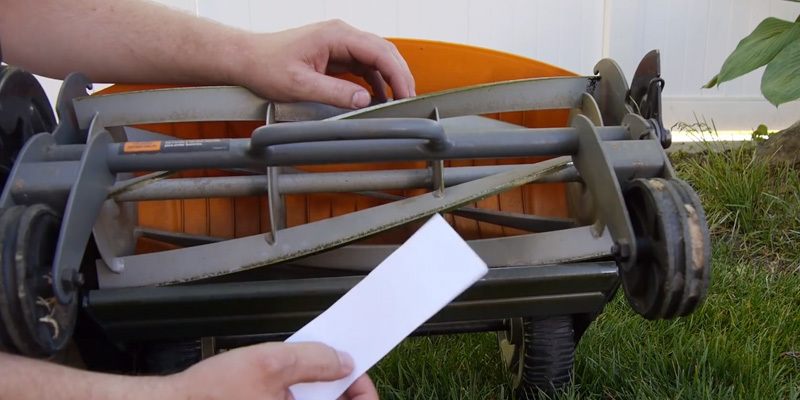 The main part of any lawn mower is its blade part. The number and quality of the blades used define the precision of the grass cutting. As a rule, the blades made of high-quality materials need to be sharpened rarely. Usually, push reel mower’s blades are made of either heat-treated or alloy steel. A heat-treated steel is stronger of the two and does not require frequent sharpening, but its manufacture is quite expensive. Alloy steel blades are cheaper to produce but require a more frequent sharpening. 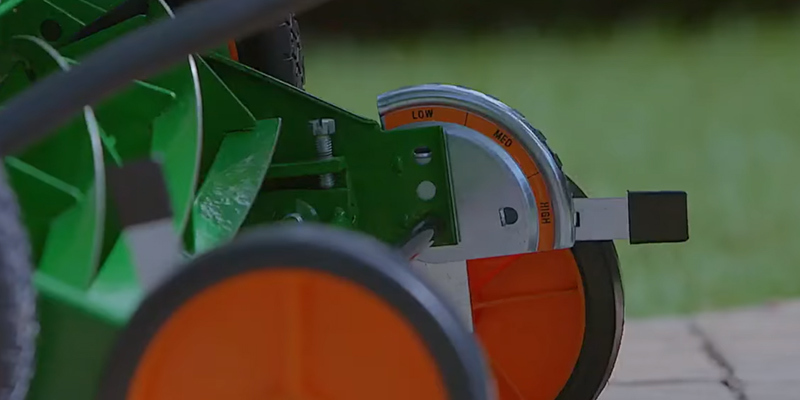 The number of blades on the reel determines the mowing speed and quality. With that, a hand push lawn mower with more blades cuts more grass per one cutting reel rotation. Another thing to take into consideration is two types of mower cutting systems: contact-free and contact. In the former system, the reel does not touch the blades, thus preventing the blades wearing. However, this system requires an accurate adjustment. In the latter, the reel contacts with the cutting blade so the lawn mower operates like scissors, with the need for frequent sharpening of the blades being the downside. The last but not the least tip at choosing a perfect hand push reel lawn mower is its conveniences. First, there are two grass discharge types: forward and rear. Please note, that in case of the rear discharge, the grass falls right on your feet. That is why a modification with a grass catcher (or with the option to install it) will make your push reel lawn mower more easy-to-use. Cushioned foam or plastic handle grips will prevent sliding and provide a comfortable handling of the push lawn mower. 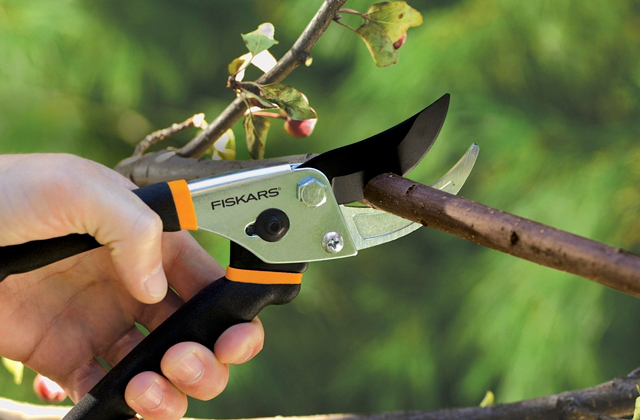 A height-adjustable handle will make for a convenient grasp of the landscaping tool, and a folding handle will provide easy storage and transportation. A lightweight push lawn mower will make the grass cutting simple for elderly people. Q: What is the difference between a push reel and a rotary mower? A: A rotary mower is powered by gasoline or electricity. 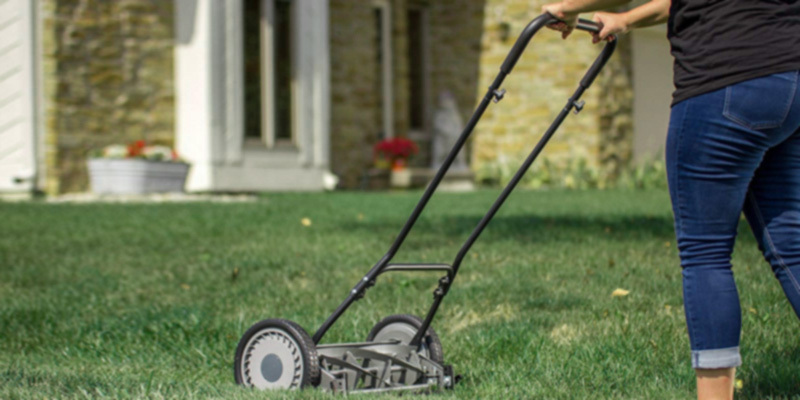 A push lawn mower consumes no fuel: the reel rotates as you walk, which means there is no pollution. 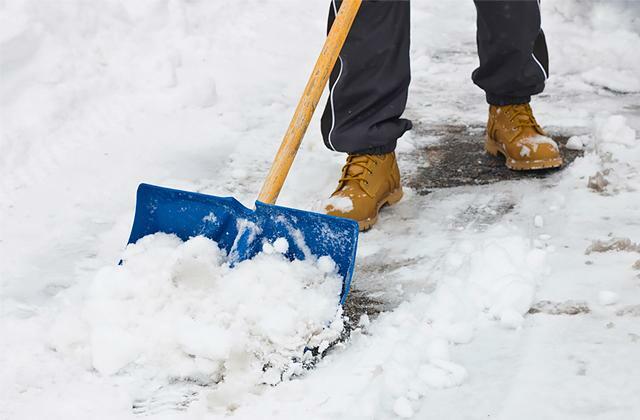 You breathe in the fresh air and burn calories while tidying up your yard! 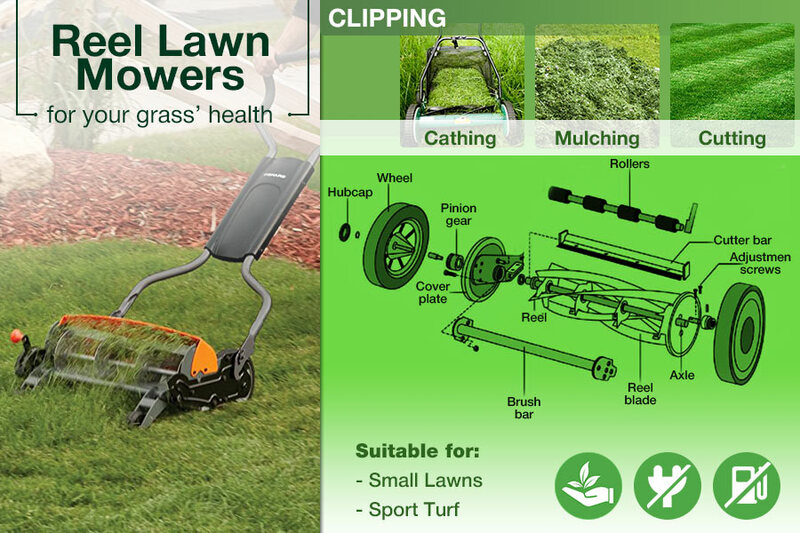 Moreover, it provides an accurate cut to prevent tearing and damaging the grass. A wonderful choice for keeping your lawn healthy and green! Q: How to choose a push lawn mower for caring for my lawn? 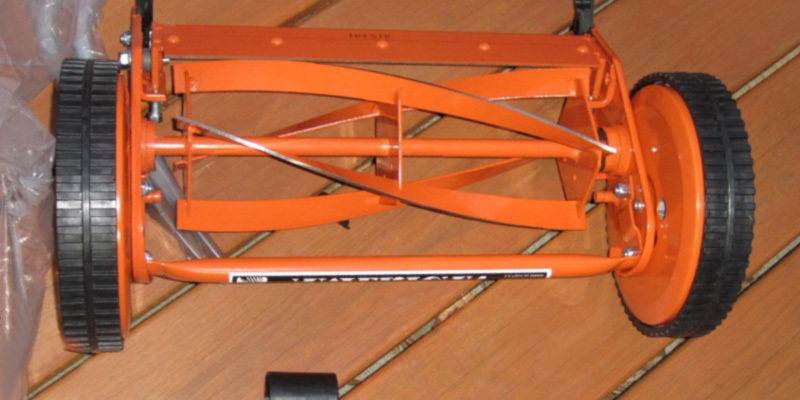 A: This human-powered device is usually used for mowing smaller lawns. To select an appropriate model, you should keep in mind the terrain of your land plot. When working on a flat and smooth surface, a model with a wide cutting width is an optimal solution. For mowing the grass near the obstacles comfortably, pick a smaller and, hence, more lightweight mower. Q: Do the blades require frequent sharpening? A: It depends on many things, such as your lawn size, machine’s maintenance, blades material, the design of your push mower, etc. To ensure a constant efficient operation and high performance of the equipment, it is advisable to decide on a unit with the heat-treated steel blades. The implementation of a contact-free cutting design provides a better protection of the blades from wearing. Some models only need sharpening once a season, or even once a few years. Those with a contact cutting system may require a more frequent honing, but it still depends on their usage. Q: How to perform a push mower maintenance? A: The key to an excellent performance of the tool is keeping the blades properly aligned, clean, and sharp. Please, consult the user’s manual for performing the maintenance of your model. Usually, it takes just a few minutes if you carefully follow the instructions. And, do not forget to clean and sharpen machine's cutting edges as needed! Q: Do I need a grass catcher? A: Left on the lawn, the clippings will turn into useful mulch that will quickly decompose, enriching the soil with essential nutrients. However, if you prefer to collect them for filling a compost pit, consider a model with a grass catching option. Some units come with a grass catcher. Q: How to choose the proper cutting height? A: The general rule is to remove a third of the grass length when mowing. However, the cutting height depends on the grass type. For example, fescue is recommended to keep 2.5”-3” tall, St. Augustine looks and feels better when it is 2”-3” tall, while 1”-1.5” height is best for zoysia and Bermuda grass species. That is why you should consider the options your chosen tool provides for keeping your lawn green and tidy. 1. 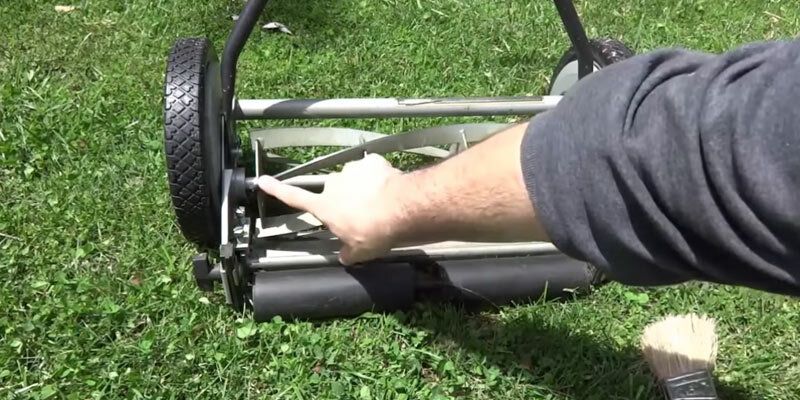 Brett & Kate McKay In Praise of the Push Reel Mower, The Art of Manliness. May 23, 2012. 2. Sayward Rebhal PushReel Mowers Versus Rotary Mowers, Networx. June 26, 2013. 3. Tom Oder How to have a great lawn, Mother Nature Network. March 14, 2012. 4. 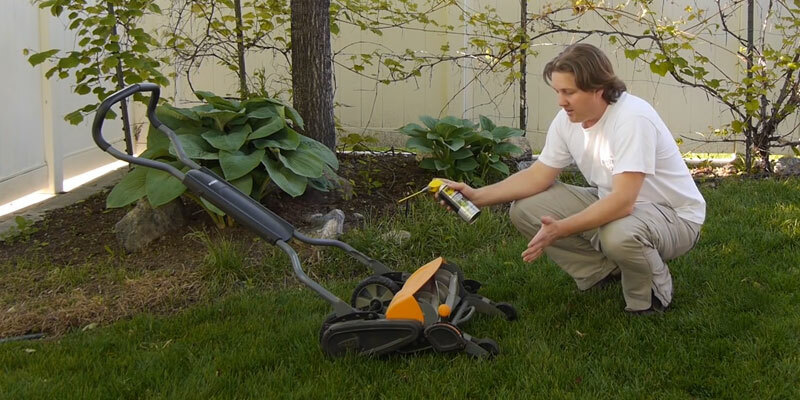 Timothy Dahl How to Choose the Right Lawn Mower for Your Yard, Lifehacker. March 26, 2015. 5. 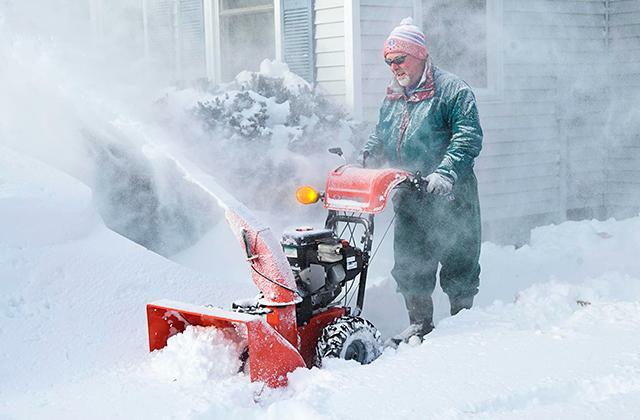 21 Expert Organic Lawn Care Tips, Popular Mechanics. 6. How to Buy a Lawn Mower, wikiHow. March 2017.